A month or so back, I was taking my early coffee in a window seat of a cafe in Glebe, Sydney's inner-west district of of New Age businesses and health-food stores. 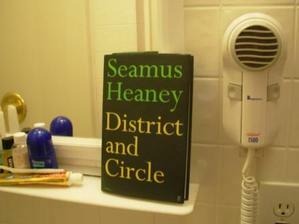 I was gazing with that precaffienated stupor in which everything in the field of vision seems equally important, when something jumped at me from a little way down the counter: a slim hardcover volume, Seamus Heaney's District and Circle. Loitering in the pose of an abandoned newspaper, it fairly purred with intention. As a public transport expert haunted by a literary past, I'm expected to notice public transport literature. The title poem is about a ride on the London Underground. Another level down, the platform thronged. Heaney is not exactly to my taste, but I had to admire the eye that could see the Underground as a landscape, and thus see the strap hanging from the ceiling as a "roof-wort". This book is registered at bookcrossing.com/597-4079837. Please visit to say that it's found a good home. Enjoy and pass on. [Signature illegible] BCID 597-4079837. Bookcrossing.com turns out to be a fine and simple idea. Anyone who has a book that they liked but don't want to keep is encouraged to register it at the site, write a note in the front, such as the one above, with the "Book Crossing ID," then leave it somewhere where others will find it. The satisfaction, presumably, is that you can go back to the site and trace the movements of a book that you left, and the impressions that it made. A simple idea, yet it gave this slim volume of poems a charge of consequence. Travelling, I kept finding it in my luggage, and placing it in hotel rooms like a thing that needed my immediate attention. Finally, tomorrow, I will part with it, probably in some cafe in San Francisco. The site tells me it began its journey in its native London, so it will now have gone almost 3/4 of the way around the world. In a world where so many quotidian items have been sent to China as parts and returned reassembled, it seems almost quaint to take such an interest in the voyages of a book. But the reader of a great book often wants to share the experience. Some bookcrossing fans buy spare copies of a book they've loved to "release into the wild," and enjoy feeling their influence when someone "catches" it, reads it, and logs in. While in Portland last week, I made a point of meeting a certain mole, whose remarkable blog I continued to read even when my own voice had gone silent. I return to him for his perspectives on his Buddhist practice, especially his ability (and willingness) to write lucidly from states of confusion and despair. We also have some things in common, notably literary educations that ground our world-views but don't quite explain our careers. Now and then he treats us to a humorous drawing, or more often, a poem. That it can hold the baroque without cloying. Qantas says that the flight from Sydney to Los Angeles is 12.5 hours, but this means nothing to me. I can never just turn space into time that way. I need a map. I need, in my head, a large round ocean -- the Pond, Aussies call it -- and a dot crossing it representing the plane. Qantas provides that too, but only at takeoff and landing. Mid-way, there is no space, just two meals, three consecutive movies and a short interval of lights-out to simulate the foreshortened night. I can handle this on flights up to eight hours or so. For that distance, I can keep a map in my head, and mark off my likely progress based on the passage of time. It's seven hours in, so we're near Hawai'i, etc. But crossing the pond, such marking always hits a crisis point, and I become like a flailing caterpillar at leaftip. I have used up all my landmarks, put all of space behind me, and yet I am still on a plane. No longer a Cartesian plane, but a badly warped Einsteinian one, where I'm sliding down a parabolic curve into the night. Ten years ago, stepping out of an airport for my first taste of Australian air, the first trees I saw looked like pines. My intellect was ready for the wonders of strange new flora, but the old homing heart craved only recognition. "Look!" I thought, "they have pines here!" I went to look closer. But up close, these pine needles looked like slender pieces of horsetail. 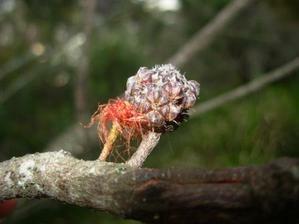 And the redness that I assumed to be pine-like bark came from minuscule furry flowers, dancing with conelike fruits. However acclimated I become, I'll probably never shake the first impression that Australian plants and animals seem designed to mislead the northerner. Like those pit-traps in the jungle -- deep holes with vines strung across them to entrap large mammals -- the landscape offers quick resemblances to draw the northerner forth into the world, so that he tumbles headlong into the chasm of the alien. Hordes of escaped convicts and military poets have sung the path into the abyss. "Common" names for Australian plants resound with the desperate longing for northern certainties, as though they were all assigned by an escaped and starving convict stumbling through the woods, hallucinating an entire Yorkshire of flora. Anything remotely conifer-like is called a pine. 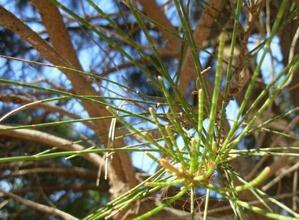 Casuarina, pictured above, is inexplicably a 'she-oak.' Ubiquitous eucalypts were called ash, boxwood, and even apple. I'd like to think I'm beyond such grasping. I try to learn only the botanical names as arbitrary and thus supposedly clean signifiers. But still, I notice my attraction to plants that cannot possibly be mistaken for anything in the north: the primary-colored plastics of protea-family flowers, the naive symmetry of Araucaria, the full-on chattering diversity of Eucalyptus. Not that such descriptions, hurled into the bush in my northern tongue, land any nearer the mark than the convict's delusions of home.